News arrives of another price reduction, this time from Tom Allen at Fraser Yachts in San Diego, as the asking price of his central agency for sale, the 28.04m motor yacht No Boundaries, drops by $260,000. No Boundaries was built by Bracewell Marine in 2006. 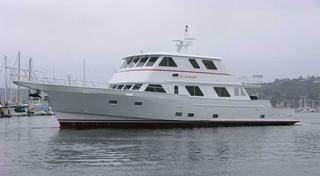 She was designed to travel the oceans giving her owners and guests the opportunity to fish and dive. With a new bait and tackle centre and only 500 hours on her Caterpillar engines, this superyacht sleeps 10 guests in two master and two guest staterooms. No Boundaries is now asking $3.49 million.